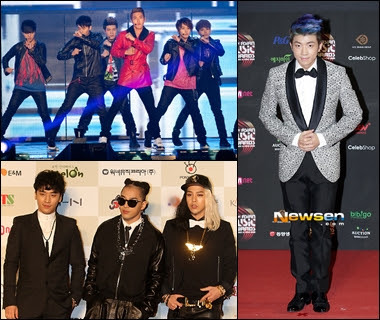 Korea Observer: Which K-pop Artist, Company Dominated Album Sales? Which K-pop Artist, Company Dominated Album Sales? MANILA, Philippines - Boy band Super Junior and their company SM Entertainment dominated physical album sales in 2012. Rankings of album sales by company and artist were posted on Korean music chart site Instiz, which showed percentage sales top K-pop artists got last year. Among the artists under SM Entertainment, Super Junior accounted for 34 percent of album sales last year, followed by TVXQ with 22 percent, SHINee with 13 percent, EXO-K with 9 percent, TaeTiSeo (subunit of Girls' Generation) with 9 percent, Girls' Generation with 6 percent, f(x) with 5 percent, BoA with 2 percent, Super Junior Happy and SM Town. At YG Entertainment, Big Bang accounted for 50 percent of the company's album sales last year, followed by G-Dragon with 26 percent, Psy with 12 percent, 2NE1 with 4 percent, Epik High with 3 percent, GD & TOP with 2 percent, Se7en with 2 percent, YG Family and Tablo. At JYP Entertainment, 2PM through Wooyoung accounted for 36 percent of the company's album sales followed by miss A with 19 percent, Wonder Girls with 17 percent, 2AM's Jo Kwon with 11 percent, 2PM with 9 percent, JJ Project with 7 percent and Park Jin-young with 1 percent. By company, SM Entertainment ranked No. 1 garnering 28 percent of album sales in 2012. It was followed by YG Entertainment with 15 percent, Woolin Entertainment (which manages boy band Infinite) with 6 percent, Cube Entertainment (BEAST, 4Minute, G.NA) with 5 percent, FNC Entertainment (FT Island, CNBlue, Juniel) with 5 percent, WM Entertainment (B1A4) with 3 percent, C-JeS Entertainment (JYJ) with 3 percent, JYP Entertainment with 3 percent, CCM (T-ara) with 3 percent, TS Entertainment, Loen, TOP, Starship, DSP, Shinhwa, Stardom, Pledis, Sidus HQ and J. Tune. Based on ranking of all artists, Super Junior copped first place, garnering 10 percent of total album sales last year. The boys were followed by Big Bang with 8 percent, various artists with 7 percent, TVXQ with 7 percent, Infinite with 4 percent, SHINee with 4 percent, G-Dragon with 4 percent, B1A4 with 4 percent, JYJ's Junsu with 3 percent, Busker Busker with 3 percent, T-ara with 3 percent, BEAST with 3 percent, CNBlue with 3 percent, EXO-K with 3 percent, TaeTiSeo with 3 percent, BAP, Teen Top, FT Island, Psy, Girls' Generation, IU, f(x), KARA, Shinhwa, Block B, Jay Park, Sunggyu and MBLAQ.